It is no secret that Black Metal promotes everything cold, dark, and grim often bringing out the corpse paint and photo sessions in the forest. While these are very cliche aspects there are plenty of topics that are used in said genre. 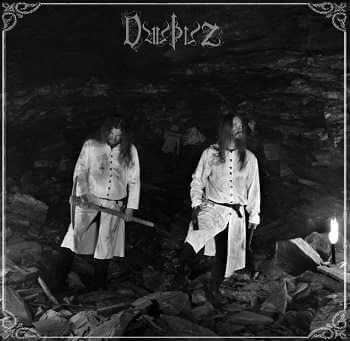 With their latest release entitled “Die Grubenmäre” Dauþuz have created their own blend of Atmospheric Black Metal centered around the historical subject of Mining. The album title itself translates into “The Mine” and it takes the listener on a dark journey through cavernous mines where no light shines and if that is not a worthy subject to pay homage to in a Black Metal Band then I am not sure what is. This album is filled with everything one could hope for, infectious melodies, slow passages, atmospheric instrumentals, and agonizing vocals. I was plesantly surprised by this release and it had me hooked after the first few songs. The opening intro track Reminicere is dripping with the echoes of a slow descent into the darkness below which leads into Extero Metallum, and at this point there is no turning back.. You are trapped. From here this album takes the listener on a journey through the caverns each song mirroring every emotion and it is almost tangible. The mix of high pitched vocals reminiscent of DSBM and shrieks are what add to the over all atmosphere. Now aside from this release being very dark there is also an epic scale to it, I often caught myself picturing a setting straight out of Lord of the Rings. Being a lover of all things fantasy this album pairs well with a good book. Are you sold yet? Regardless this album flows together perfectly and there is a fine beginning, middle, and end. Once it was over there was a strong urge to start it all over. I highly recommend giving this album a listen you will not be disappointed, this is definitely an escape from reality.